Patriarch of Moscow and All Russia Kirill, who was staying in Kiev earlier this week, thanked the Ukrainian clergy for efforts made to maintain unity in the Church. He also praised the Ukrainian branch of the Orthodox Church for its contribution into the revival of Orthodox Christianity in the republic in the past two decades. 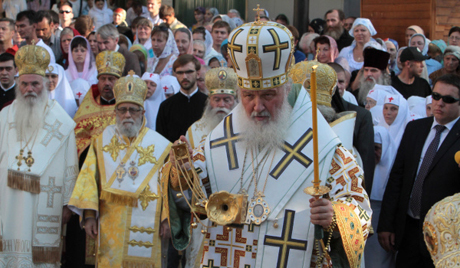 May of 2012 marked 20 years since Metropolitan Vladimyr (Sabodan) was enthroned as the head of the Ukrainian Orthodox Church (an autonomous church under the Moscow Patriarchate). Patriarch Kirill stressed that Metropolitan Vladimir should be praised for canonical unity and peace within the Ukrainian church. Although today Ukraine has three institutions of the Orthodox Church only one of them – the Ukrainian Orthodox Church under the Moscow Patriarchate – is officially recognized as a canonical institution. Some people in Ukraine attribute it to the fact that the new authorities no longer provide moral and financial support to Old Believers (schismatics) and the Old believers do not have incentive to continue their activities. Others believe that frequent visits of Patriarch of Moscow and all Russia Kirill to the republic and the efforts of the Ukrainian Orthodox church, which was striving for the unity with Moscow, were much stronger than the illusionary idea of the “free and independent” church. Metropolitan Vladimir of Kiev and All Ukraine who turned 76 years last November is confident that it was God who saved the Ukrainian Orthodox Church from schism. At present the Ukrainian Orthodox Church under the Moscow Patriarchate unites 46 eparchies, which comprise more than 12,000 parishes and more than 200 monasteries. Naturally, it is too early to speak about the complete overcoming of the schism. It will take several decades to cure the wounds. But a lot has been done. Salvation is where the fullness of the Orthodox Christianity is and where people who praised God in different language gather around one throne, Patriarch Kirill concluded.